With nearly 200 hundred episodes already I hope to post updates here as new episodes are added. It's a while since we concentrated on Fantasy so this week we talked about fantastic creatures that inhabit worlds of myth and fantasy. 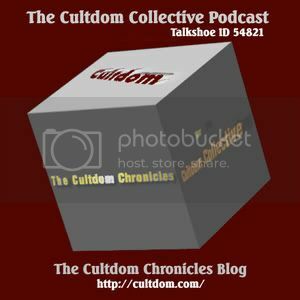 Cultdom Episode 108 - Torchwood Series 4 Episodes 1 and 2 Spoilers! With 6 episodes show in the UK and 7 elsewhere the Collective give a mid-season review of Torchwood Miracle Day  Epi. 1 to 6 then Epi. 7 discussed towards the end of the podcast. The Cultdom Collective review the second episode of the latest run of Dr Who Night Terrors Series 6 Episode 9.